There really is something magical about flowers and plants - just think about how nice it feels to get out into nature and enjoy the vibrant colours, smells and textures of the natural world. Yet, for most of us we don’t have as much time outdoors as we might like, but that doesn’t mean you can’t enjoy nature. You just have to find ways to bring nature to you instead, and there are some super simple ways to do that in the home. So to get you started we share five of our top ways to transform your home decor with flowers, but don’t just stop at our list - use your imagination, along with our ideas and get creative! Investing in some simple, yet stylish house plants is probably the easiest way to get flowers and nature into your home. Most house plants are really easy to care for, and last ages, so if you’re not very green-fingered it’s an ideal option. Plus you can get plants with or without flowers, so you’ve got lots of choice. designs, colours and sizes. Why not check out your local florist for some inspiration? If you’ve got a section of your home that’s looking a bit bare, why not spruce it up with a seasonal flower shrine. 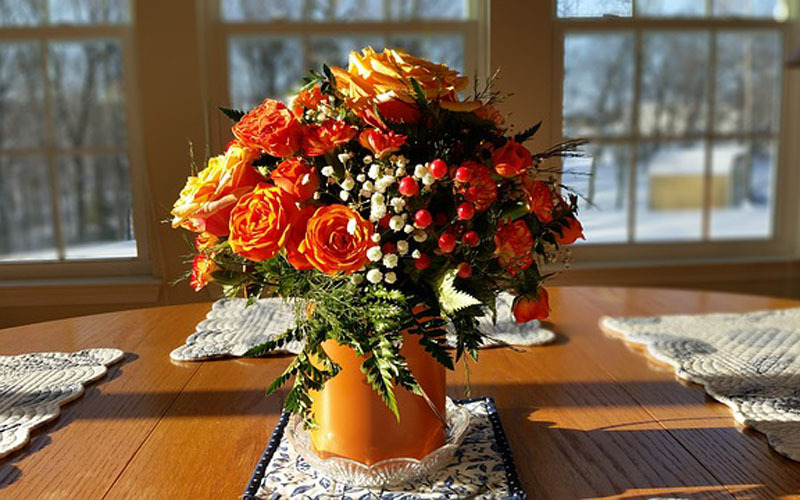 You can choose flowers and plants that represent the current season, along with picture and other bits and pieces, and really celebrate the seasons in style. And if you don’t fancy picking your own flowers, just order flowers by post and have them sent right to you. The great thing about this is that you can update it according to the time of year, so you get a constantly changing display to enjoy. A lot of people have window boxes as a way to display flowers, but why not bring that glorious colour inside, and have some flowers delivered to display inside your home on some spare shelves. It’s a simple way to display flowers and use up existing space. You could even mix and match flowers with photo frames and other ornaments, to really personalise it. Feeling inspired to get going right away? See if your local flower shop offers same day flower delivery, and bring some flowery magic into your life without a wait. Garlands used to be a really popular floral option - it’s basically a string of flowers looped together that you can wrap around photo frames, doorways, or anything you want really. They might not be quite as popular as they once were, but they are still a really stunning way to display flowers in the home. And they are so versatile too, you can put them virtually anywhere, and move them around at will. We will say though that a properly made garland is a fairly intricate piece of work, so while you can make them yourself, we’d probably recommend speaking with some florists to get some quotes. That way you know that the flower delivery will be of great quality, and will last longer. And a lot of places do next day flower delivery so you might not have to wait too long at all.